Dr. Pelto's Blog: When is a shot for heel pain needed? When is a shot for heel pain needed? Oh, the dreaded shot! No one likes a cortisone injection when they have plantar fasciitis. Many people come in and they say, “I will do anything, but I don’t want a cortisone.” The way I explain cortisone to people is that you’re going to walk in with pain and you’re going to walk out pain-free. 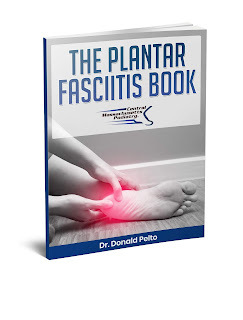 That happens about 90% of the time with people with plantar fasciitis. That doesn't mean that that one cortisone injection is going to take away all the pain forever, but it’s what we call therapeutic and diagnostic. So let me explain a little bit more. Therapeutic means you’re going to have some type of therapy that will help you get better and it’s going to take away some of the inflammation, it’s going to take away the pain because of the Novocain, but it may last for a couple of weeks or a couple of months. Then I also say that it’s diagnostic. When it’s diagnostic, it helps me determine that that’s the cause of plantar fasciitis. By putting the medicine in there, if it numbs it up and makes the pain go away, then I can confirm that diagnosis. So a shot is usually needed for heel pain after you've tried things that didn't work; after you've tried icing, anti-inflammatories, stretching, physical therapy, or even if you come to see us on the first visit, I find that a cortisone injection is the quickest way to get relief for patients.